Download "Kaseya Traverse. Kaseya Product Brief. 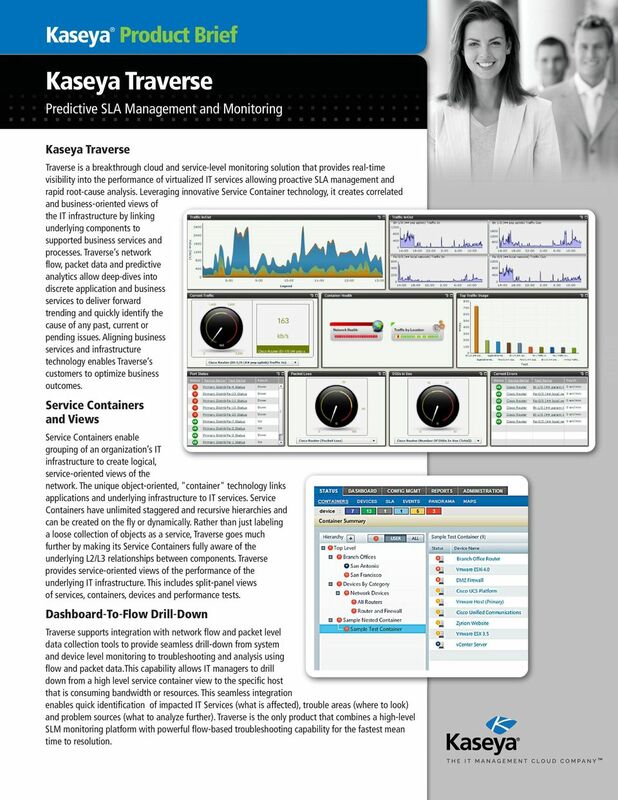 Predictive SLA Management and Monitoring. Kaseya Traverse. Service Containers and Views"
1 Kaseya Product Brief Kaseya Traverse Predictive SLA Management and Monitoring Kaseya Traverse Traverse is a breakthrough cloud and service-level monitoring solution that provides real time visibility into the performance of virtualized IT services allowing proactive SLA management and rapid root-cause analysis. Leveraging innovative Service Container technology, it creates correlated and business oriented views of the IT infrastructure by linking underlying components to supported business services and processes. Traverse s network flow, packet data and predictive analytics allow deep-dives into discrete application and business services to deliver forward trending and quickly identify the cause of any past, current or pending issues. Aligning business services and infrastructure technology enables Traverse s customers to optimize business outcomes. Service Containers and Views Service Containers enable grouping of an organization s IT infrastructure to create logical, service oriented views of the network. The unique object oriented, "container" technology links applications and underlying infrastructure to IT services. Service Containers have unlimited staggered and recursive hierarchies and can be created on the fly or dynamically. Rather than just labeling a loose collection of objects as a service, Traverse goes much further by making its Service Containers fully aware of the underlying L2/L3 relationships between components. Traverse provides service oriented views of the performance of the underlying IT infrastructure. This includes split panel views of services, containers, devices and performance tests. Dashboard To Flow Drill Down Traverse supports integration with network flow and packet level data collection tools to provide seamless drill down from system and device level monitoring to troubleshooting and analysis using flow and packet data.this capability allows IT managers to drill down from a high level service container view to the specific host that is consuming bandwidth or resources. This seamless integration enables quick identification of impacted IT Services (what is affected), trouble areas (where to look) and problem sources (what to analyze further). Traverse is the only product that combines a high level SLM monitoring platform with powerful flow based troubleshooting capability for the fastest mean time to resolution. 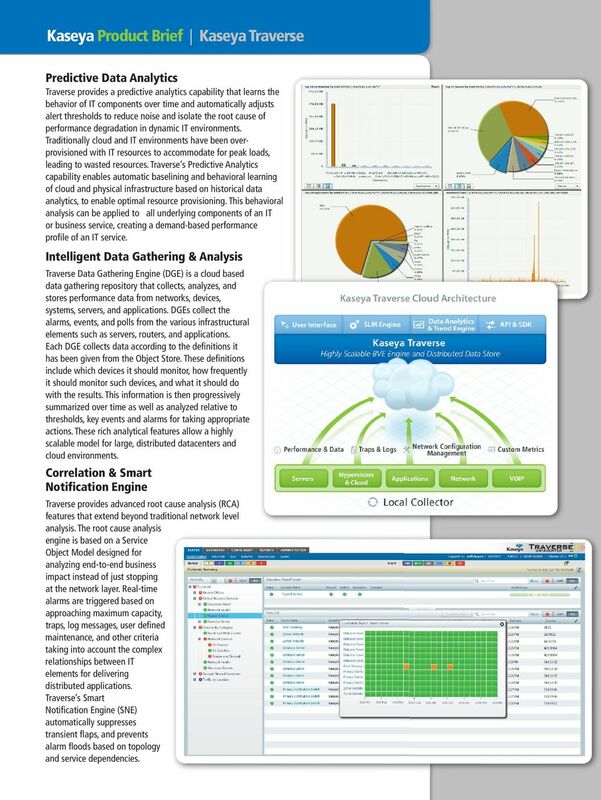 2 Kaseya Product Brief Kaseya Traverse Predictive Data Analytics Traverse provides a predictive analytics capability that learns the behavior of IT components over time and automatically adjusts alert thresholds to reduce noise and isolate the root cause of performance degradation in dynamic IT environments. Traditionally cloud and IT environments have been overprovisioned with IT resources to accommodate for peak loads, leading to wasted resources. Traverse s Predictive Analytics capability enables automatic baselining and behavioral learning of cloud and physical infrastructure based on historical data analytics, to enable optimal resource provisioning. This behavioral analysis can be applied to all underlying components of an IT or business service, creating a demand-based performance profile of an IT service. Intelligent Data Gathering & Analysis Traverse Data Gathering Engine (DGE) is a cloud based data gathering repository that collects, analyzes, and stores performance data from networks, devices, systems, servers, and applications. DGEs collect the alarms, events, and polls from the various infrastructural elements such as servers, routers, and applications. Each DGE collects data according to the definitions it has been given from the Object Store. These definitions include which devices it should monitor, how frequently it should monitor such devices, and what it should do with the results. This information is then progressively summarized over time as well as analyzed relative to thresholds, key events and alarms for taking appropriate actions. These rich analytical features allow a highly scalable model for large, distributed datacenters and cloud environments. Correlation & Smart Notification Engine Traverse provides advanced root cause analysis (RCA) features that extend beyond traditional network level analysis. The root cause analysis engine is based on a Service Object Model designed for analyzing end to end business impact instead of just stopping at the network layer. Real time alarms are triggered based on approaching maximum capacity, traps, log messages, user defined maintenance, and other criteria taking into account the complex relationships between IT elements for delivering distributed applications. Traverse s Smart Notification Engine (SNE) automatically suppresses transient flaps, and prevents alarm floods based on topology and service dependencies. 3 The multi stage alarm engine provides a comprehensive escalation process to send notifications based on how long a device has been in warning or critical condition, and on time of day and status on repeated polling. The smart suppression engine uses complex heuristics to avoid false suppression of alarms in redundant networks. Event Manager Traverse captures processes, archives and displays a variety of events such as SNMP Traps, Windows Events and Syslogs. Traverse supports acknowledgement and annotation of events, suppression, de-duplication and correlation. The seamless integration with Service Containers immediately identifies which services an event belongs to and the impact of an event on an IT or application service. Traverse s patented distributed DGE architecture allows scaling to very large deployments. It also integrates with most enterprise ticketing systems out of the box. SLA Monitoring and Measurement Traverse supports specification of SLAs for services and infrastructure in terms of defined metrics, such as, availability, latency, Committed Information Rate (CIR) and much more. Traverse measures compliance against defined SLAs, and provides reports of compliance against SLAs, using real time SLA dashboards. In combination with trend reports, SLA dashboards indicate time to non-compliance providing a valuable planning tool that can alert to a pending issue while providing time for remediation before SLAs become compromised. 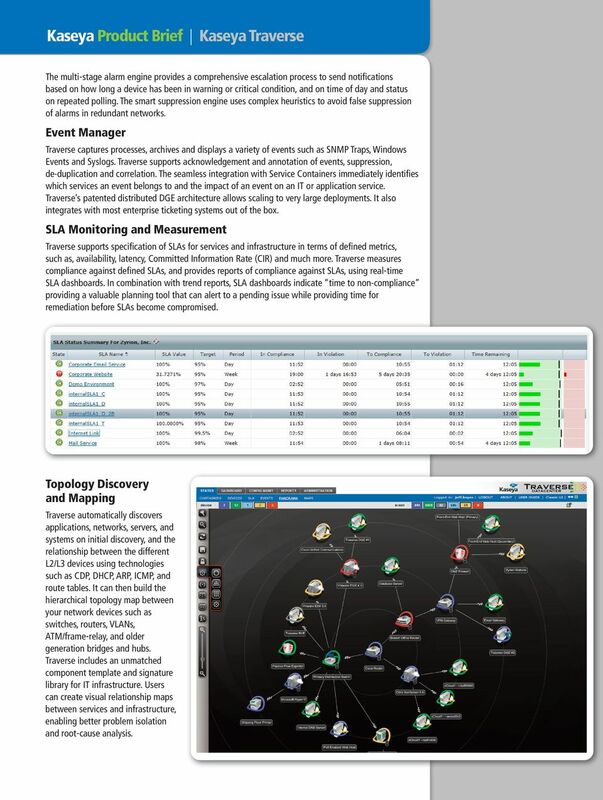 Topology Discovery and Mapping Traverse automatically discovers applications, networks, servers, and systems on initial discovery, and the relationship between the different L2/L3 devices using technologies such as CDP, DHCP, ARP, ICMP, and route tables. It can then build the hierarchical topology map between your network devices such as switches, routers, VLANs, ATM/frame relay, and older generation bridges and hubs. Traverse includes an unmatched component template and signature library for IT infrastructure. Users can create visual relationship maps between services and infrastructure, enabling better problem isolation and root cause analysis. 4 Real Time and Historical Reporting Traverse retrieves data upon request and generates reports and views based on the actual state of infrastructure. 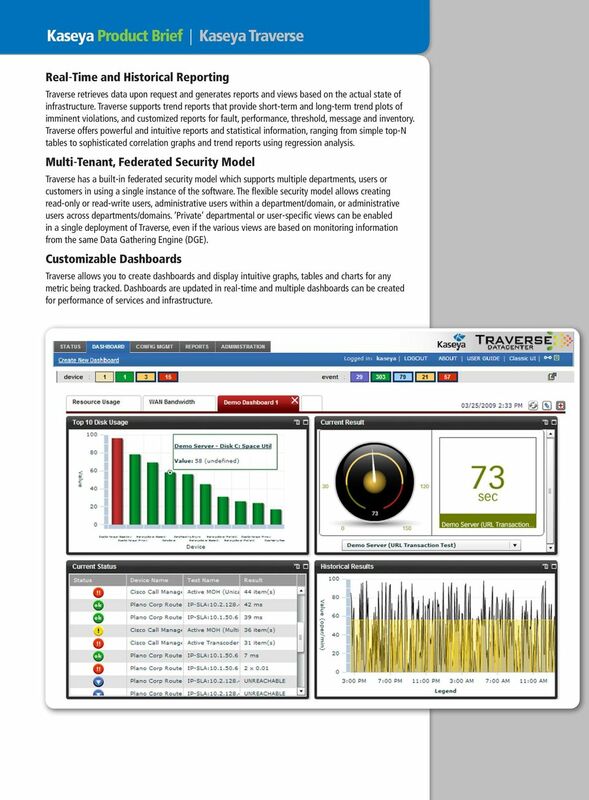 Traverse supports trend reports that provide short term and long term trend plots of imminent violations, and customized reports for fault, performance, threshold, message and inventory. Traverse offers powerful and intuitive reports and statistical information, ranging from simple top N tables to sophisticated correlation graphs and trend reports using regression analysis. Multi Tenant, Federated Security Model Traverse has a built in federated security model which supports multiple departments, users or customers in using a single instance of the software. The flexible security model allows creating read only or read write users, administrative users within a department/domain, or administrative users across departments/domains. Private departmental or user specific views can be enabled in a single deployment of Traverse, even if the various views are based on monitoring information from the same Data Gathering Engine (DGE). Customizable Dashboards Traverse allows you to create dashboards and display intuitive graphs, tables and charts for any metric being tracked. Dashboards are updated in real time and multiple dashboards can be created for performance of services and infrastructure. 5 Mobile Views Mobile-optimized displays enable access to critical management information for administrators, service owners and operators and support touch-enabled drill-down menus that are easier to navigate on small device screens. Support is provided for iphone, ipad and Android devices. Url Transaction Monitor Traverse supports definition of application use test cases, and specification of frequency of test execution. Traverse runs tests against the production environment and monitors key performance metrics for services and infrastructure. This capability was developed for testing production environments to confirm that services are performing as expected, and renders on demand when actioned by a user. Integrated NCM Traverse has an integrated Network Configuration and Change Management (NCM) module which automatically backs up configurations of all routers, firewalls, switches and load balancers within the network. You can compare the changes made to any configuration and restore the previous configuration at any time. Having a tightly integrated NCM module provides instant troubleshooting and faster mean time to recover (MTTR). Support for Wide Range of Infrastructure Traverse supports a wide range of infrastructure that includes applications (Oracle, SQL Server, DB2, MySQL, Exchange, Apache, WebLogic, etc. ), servers (Linux, Solaris, HP UX, Windows, Novell, etc. ), network devices (Cisco, Foundry, Juniper, Avaya, Amperion, etc. ), firewalls, content delivery systems, storage infrastructure, fixed wireless nodes, VoIP infrastructure, and environmental management components. Open API Traverse has a flexible API framework which allows extending the product easily. While Traverse provides common notification mechanisms, such as , pager, trouble ticket interface and SNMP traps, the API allows custom notification and action development as needed. 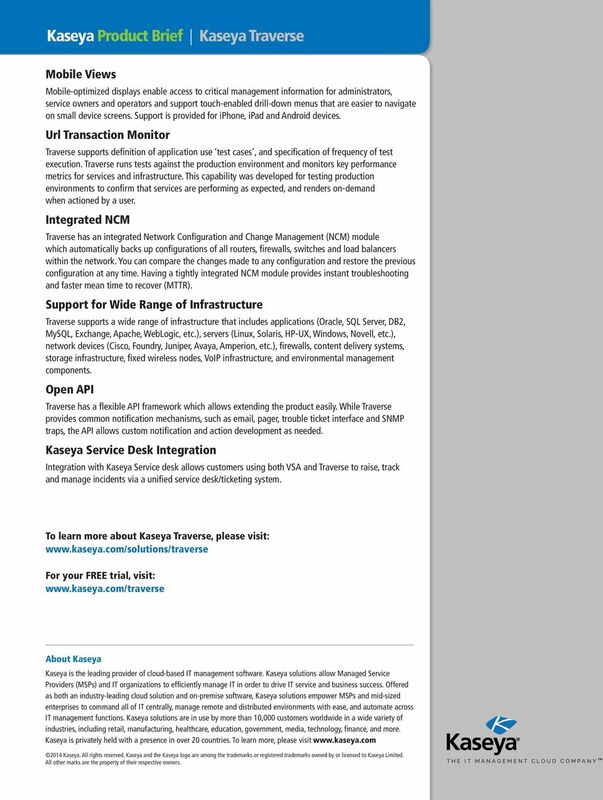 Kaseya Service Desk Integration Integration with Kaseya Service desk allows customers using both VSA and Traverse to raise, track and manage incidents via a unified service desk/ticketing system. To learn more about Kaseya Traverse, please visit: For your FREE trial, visit: About Kaseya Kaseya is the leading provider of cloud-based IT management software. Kaseya solutions allow Managed Service Providers (MSPs) and IT organizations to efficiently manage IT in order to drive IT service and business success. Offered as both an industry-leading cloud solution and on-premise software, Kaseya solutions empower MSPs and mid-sized enterprises to command all of IT centrally, manage remote and distributed environments with ease, and automate across IT management functions. Kaseya solutions are in use by more than 10,000 customers worldwide in a wide variety of industries, including retail, manufacturing, healthcare, education, government, media, technology, finance, and more. Kaseya is privately held with a presence in over 20 countries. To learn more, please visit Kaseya. All rights reserved. Kaseya and the Kaseya logo are among the trademarks or registered trademarks owned by or licensed to Kaseya Limited. All other marks are the property of their respective owners. Did You Know...? Starnet offers numerous ITrelated services in support of many of today s complex IT operational issues. --- Who s watching over your network to insure that it is operating efficiently? White White Paper Paper Drive Down IT Operations Cost with Multi-Level Automation Overview Reducing IT infrastructure and operations (I+O) budgets is as much on the mind of CIOs today as it s ever been.